A warm and generous soul, Nancy Carole (Baker) Brewer, 78, died April 18, 2018, in her Franklin home with loved ones at her side. She was born June 23, 1939, in Fort Wayne to Miles K. Baker and Vera Etola (Gottshall) Baker, who predeceased her. When she was a student at South Side High School in Fort Wayne, Nancy fell in love with her future husband, Lloyd A. Brewer (and his then-flat top haircut) after they met through their respective Methodist Youth Fellowship groups at the Christ Child Festival in 1955. After they married on March 22, 1958, they lived in Indianapolis, Muncie and North Manchester, Ind. ; then in Oswego, N.Y.; Champaign-Urbana, Ill.; Terre Haute, Ind. ; and finally Wausau, Wis., as Lloyd pursued his personal education and career as a college professor. They moved to the Franklin area in 1993 to be near family members. They recently celebrated their 60th wedding anniversary. Nancy worked as a medical transcriptionist, learning medical terminology and working with physicians at the Carle Clinic in Champaign-Urbana, Union Hospital in Terre Haute and Family Health Specialists in Wausau. She found the work to be very interesting. She loved to knit and made many baby blankets and hats for her family, friends and children at Riley Hospital. Nancy became active in Franklin’s Grace United Methodist Church, especially its Caring Ministry group. She truly enjoyed helping others and found it difficult to be on the receiving side of that same ministry in her final years. As Nancy dealt with the side effects of lupus attacking various muscles and organs throughout her life, she often said she was going to have a “talking-to” with God when she died. She may still be talking! In addition to Lloyd, she is survived by her three daughters, Colette (John) Jackson of Franklin; Susan (Rodney) Earlywine of Owatonna, Minn.; and Jennifer Le Francois of Venus, Fla. She is also survived by her five grandchildren, Lauren (Nick) Arnold of Terre Haute; Caitlin Jackson of Bloomington; Devin Earlywine of Ellensburg, Wash.; Alexa (Sam) Helmich of Des Moines, Iowa; and Noah Le Francois of Venus, Fla. She is also survived by a great-grandson, Rory Jackson Arnold. The Rev. Jenothy Rather will conduct a celebration of life for Nancy on Saturday, April 28, 2018 at 2:30 p.m. at Grace United Methodist Church, 1300 E. Adams Dr., Franklin. Visitation will precede the service, beginning at 1 p.m. The family suggests memorial contributions may be made to the Caring Ministry of Grace United Methodist Church. Swartz Family Community Mortuary and Memorial Center 300 South U.S. 31 (Morton Street) in Franklin, IN. is handling the funeral arrangements. 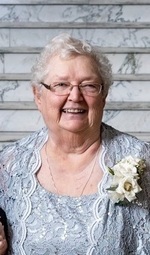 To sign the online guestbook or to send the family a personal message, please visit www.swartzmortuary.com or call 317-738-0202 for more information.